Teens (ages 13-18) are also welcome to take adult classes. 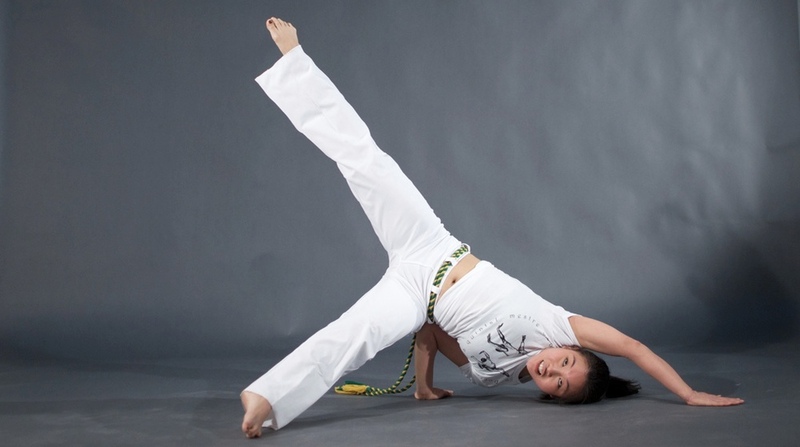 Curriculum: learn 5 core basic capoeira moves that condition you for the Level l program. Your capoeira practice is built on the five core moves that you will learn in Intro & Conditioning. Feel the benefits, wisdom and magic of capoeira. The 30 minute classes are designed to give you the greatest conditioning in the shortest amount of time. Based on your progress, your instructors will invite you to participate in the Level l Program. See what people are saying about our Intro & Conditioning Program. Curriculum: 13 basic moves including five circular kicks, combinations, plus the first five sequences of attacks and escapes with a partner. Music lessons with capoeira instruments and how to play the game of capoeira inside the circle is part of Level l.
The Level l program teaches the art of capoeira flow. In capoeira we do not block, we duck out of the way of attacks and in our escapes, we counterattack. We don’t “fight” or “spar,” we play. A good capoeira game is a continuous, flowing dialogue that is both competitive and cooperative. Curriculum: New movements and combinations to master balance, strength and control. Sequences 6-10. Level ll develops great upper body strength and balance. Curriculum: Advanced kicks and take towns. Sequences 11-15. Levels lll & lV develop speed, power, reflexes and precision. Levels lll & lV emphasize higher level self defense techniques. You develop a keen level of control so that you can play fast without accidents or injuries. Develop effective teaching and leadership skills. Our Teaching and Leadership Program explores, through hands-on experience, the art, craft and science of teaching capoeira to adults and to children.